Jess and I met three years ago. She was working for Franklin Evans and I was working for Sue Scott at her now defunct gallery. Jess was helping Franklin install his exhibition eyesontheedge. At this time we were both finishing up graduate school and were embarking on the path to being full-time artists. Over the past few years Jess and I would run into one another at openings and parties. I have been following her work since I met her in 2012. It’s crazy how much social media plays into following a person’s work. I have been following Jess on Instagram and Facebook, seeing how her multifaceted studio practice has been playing out over the past few years. More recently I have become enamored with her high relief clothing sculptures. I decided it was time for me to see her in her studio. Jess and I met on a sunny cool Sunday in Bushwick. 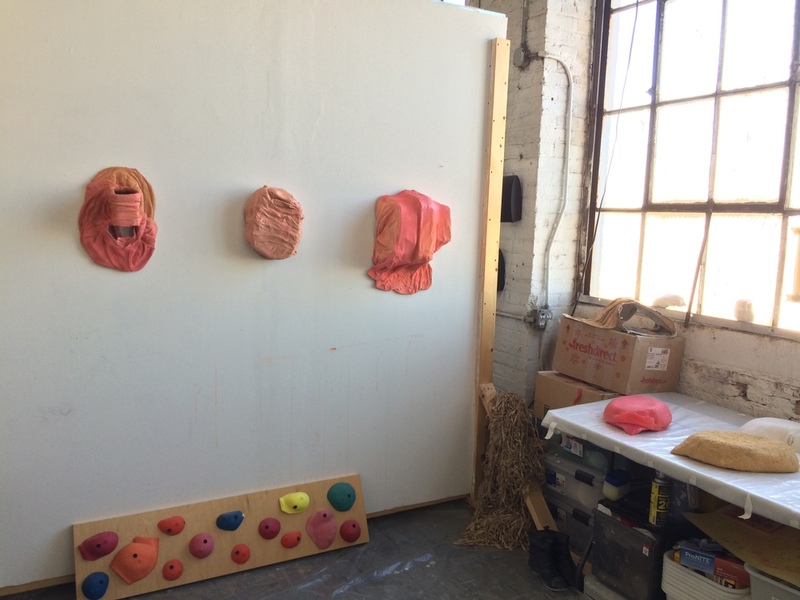 I was a few minutes early and looked around her studio building which is located away from the hubbub of the big Bushwick studio buildings. It feels more run down and part of the neighborhood than many of the buildings I have been to before. Jess meets me at the front door then leads me up to the forth floor into her space. She shares with a handful of other artists that she went to grad school with. Her space is all the way in the back with a huge window that was beaming in autumnal light casting shadows on the various pieces laid out on the table and walls. Taking in her space would seem to be a quick effort, it is not. The work in her space draws you in and begs to be looked at. 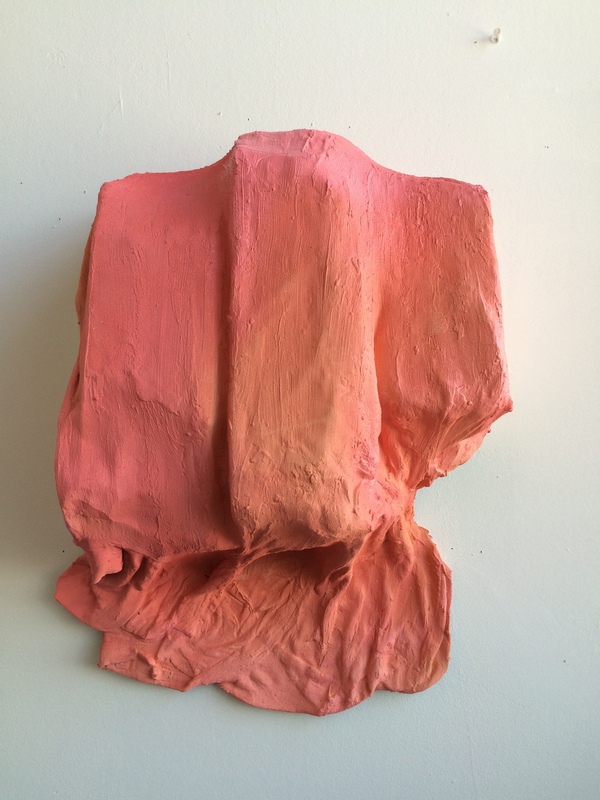 I am struck first by the pinky orange sculptures hanging on her wall. Their color is uncanny. They look like flesh tones but the color is too keyed up, and their forms are more rectilinear than the human body. There is great care taken when constructing these wall pieces. Jess says, “these are pieces of discarded clothing, that have tears or rips in them that I can no longer use.” At first glance it’s difficult to tell that they are discarded clothing, but on closer inspection you can see buttons, collars, and waistbands. It feels like they have been forced into an unnatural state of pooling and attention, softness and hardness. When I asked her what she was thinking about when creating these works she said, “I’m thinking about what it means to be a woman in a space, a queer woman in a space. 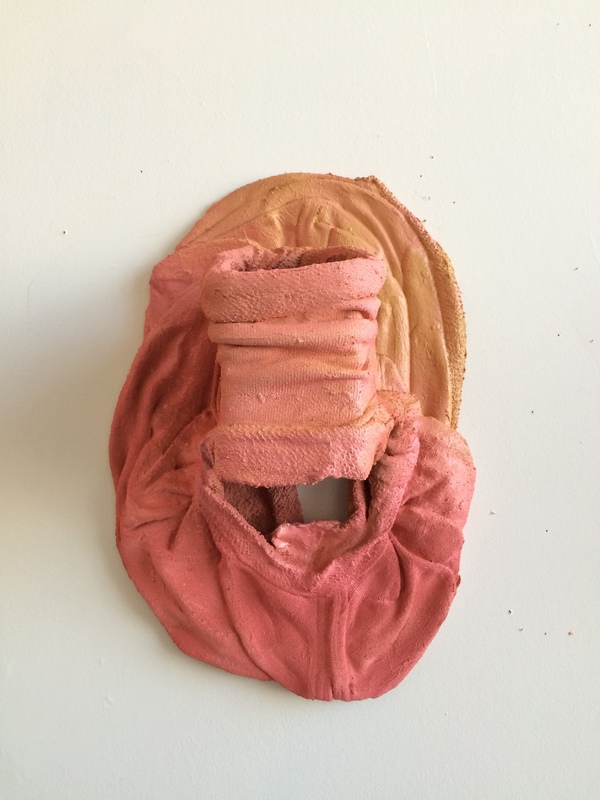 Finding a space in the world.” These works assert themselves in ways that Jess doesn’t, she has a certain unassuming quietness that is released and amplified in her works. We discuss their making in more depth, “I lay them over other works, I use joint compound and gesso to make them more pliable, and finally spray paint to create the color.” On the table next to the wall is a large swath of body casts, from different parts of Jess’s body, in some cases they have been modified (more on these later). It makes sense that the body casts inform the wall works. The wall works are about the body but create an abstract and conceptual idea of body. The works' beckon you to look closer, investigate their folds, and to wonder about the way they are formed. There are two other works on the table, more finished pieces. One of them is bright pink and the other covered in wood dust. 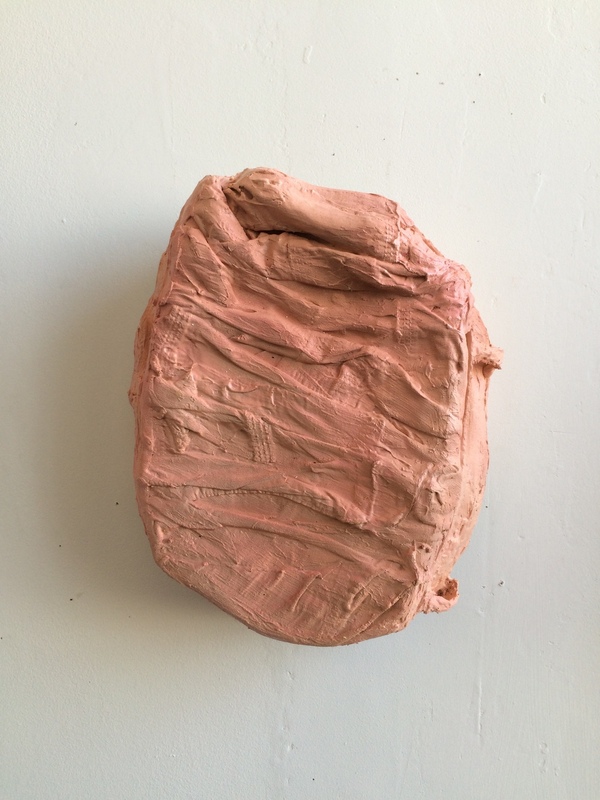 The bright pink work has a fleshy covering (silicone) over hard slick resin. Again, I cannot help but wonder how this is made, mostly because it sets my teeth on edge. The fleshy silicone gives me a gut reaction, it looks like skin but its color is off it can’t possibly be. It’s peeling off a hard bright pink surface, is it shedding it’s skin? 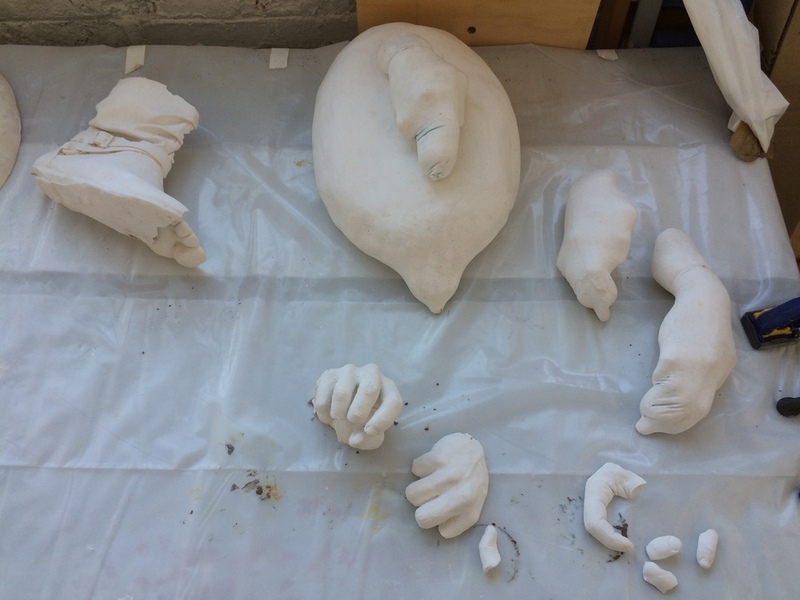 Jess quips, “the form comes from a cast of a Magnum condom that was filled to capacity with water.” I’m in disbelief; the form it takes is not a natural one but the way that Jess has finished the work I cannot help but feel that it’s something that exists in the natural world. On the final wall there is a group of about 12 paintings of various sizes. Jess identifies herself as a painter. She’s been painting and drawing since she was 5 years old. “It’s my first language, I’ve just begun painting again, a lot of these I do at home.” She used to do more figurative work when she was growing up but learned as a queer woman that there were things she shouldn’t paint. This led her to more abstract work. The current paintings are brightly colored like the sculptures but are a bit less electric in their palette. “I think about cells, and things building on one another, along with flesh. Things breaking apart or coming out.” She uses colors close to skin tone but not actual skin tone colors because they make her “uncomfortable.” It gives her enough distance from the body while still alluding to it. These paintings are in some ways more perplexing for me than the sculptures. They are a new project for Jess, which means she doesn’t have a lot to say about them at this point. They have a quickness and a repetitive mark making that makes them somewhat calmer than the sculptural work. These small paintings could go in a lot of directions, and I can’t help but think that they too will be part of the larger bodies of work and will at some point be incorporated. Looking at Jess’s website I wanted to touch on her video work in our visit. I ask her about what she’s been doing with video recently. “I am interested in sounds, recording my day (like you are doing right now).” At first it was a sort of sound diary for her, a way to navigate through her day. She has become more compelled to make video/sound works in the past couple of months. Jess says the last video she made Belly Button, 2015 is heavy on sound. This video is of her buttoning a shirt while the sound of a drill plunging a screw into a wall is heard in the background. Jess isn’t sure how the recordings of sound will be incorporated into her work. Jess tells me a bit more about her artist community here in Bushwick and with other queer women artists. As mentioned earlier Jess shares this space with people she went to graduate school with, which allows them to have easy studio visits and critiques. Something that Jess values a lot, “they know what I made before, and they can see where I am going.” This is invaluable to any artist, a group of people who’s eye you trust when talking about your work. Two artist that Jess talks to regularly are Karen Heagle and Clarity Haynes. “They are doing some very interesting work, Karen is a great painter, and I don’t know that she’s always making work about these issues but it’s there. Connecting to them has helped me have conversations about these things [body, queer issues].” To what extent their work is talking with one another seems evident in some places but distant in others. The real connection between these artists is their conversations and sharing of knowledge. Doing this visit with Jess was a long time in the making. I am happy that I was able to see her work in person and talk about the ideas and techniques behind her work. Jess's artwork is detailed and nuanced and asks to be seen. For more information about Jess check out her website.